Midweek Treat - Extra £1.99 for Two Courses at Toby Carvery Sometimes one course is not enough. Get two courses and pay an extra £1.99. 20% Off Cask Ales on Thursdays at Toby Carvery Free on Thursday? Why not pop over to a Toby Carvery and enjoy some real ale with 20% off! Gift Cards from £20 at Toby Carvery Give the gift of great food and memories with gifts cards from just £20! Vegetarian & Vegan Menu Available at Toby Carvery If you love a non-meat dish, check out Toby Carvery where there are veggie and vegan options available! Free WiFi Available at Toby Carvery Take the weight off and chill with free WiFi at Toby Carvery! Free Drink with App Downloads at Toby Carvery Get a great free drink when you download the app at Toby Carvery! Kid's Eat for £4.99 at Toby Carvery Don't let the little ones miss out on great food for less at Toby Carvery! All Day Carvery from £6.49 at Toby Carvery Feast all day at Toby Carvery with great deals from just £6.49! There are 169 Toby Carvery restaurants throughout the UK, so you can count on the fact there will always one close by. Toby Carvery has built its reputation on the fact it serves up a perfect roast dinner every day of the week. So if an important anniversary falls on a Wednesday, not a problem, as you can still enjoy that Toby Carvery quintessential English dining experience. Customers come to Toby Carvery to enjoy a roast dinner with all the trimmings. Whatever your preferred roast, there will always be a selection of meats to try. Of course, not everyone fancies a roast dinner, so the Toby Carvery does provide extra menu options for those with a smaller appetite or different dietary requirements. There is a selection of vegetarian and vegan options, plus some lighter salads, and fish dishes. Once you have finished your mains, check out the superb dessert menu, or fight the urge to take a nap with a coffee and mini pudding. You can even enjoy breakfast at a Toby Carvery! Save money with Toby Carvery offers and roll up for an all-you-can-eat feast. As they say in Yorkshire, there’s nowt like a hearty breakfast to start you off the right way. How do I use my Toby Carvery voucher? Show your voucher when it’s time to pay for your meal and enjoy a great discount on your Toby Carvery meal. Download the Toby Carvery app to your smartphone and collect ‘Rewards’ every time you eat at a Toby Carvery. Once you have collected five stamps, you can have a free pudding, and when you have 10 stamps, you have earned a free main course! 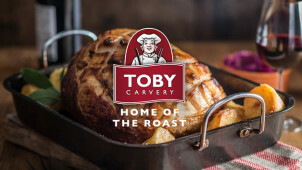 Toby Carvery also has a handy ‘Offers’ page where you will find the latest Toby Carvery promotions. Does Toby Carvery cater for food allergies? The Toby Carvery menu has various vegetarian and vegan options. If you have a food allergy or intolerance, you will have no problem finding something suitable. Most of the meat and vegetable dishes are gluten-free, but some do contain milk. Consult the Toby Carvery allergen guide for more detailed information. Toby Carvery is a family-friendly restaurant. Kids have their own menu with plenty of vegetables and smaller portions. There is also a Children’s Meal Deal. Can I buy a Toby Carvery gift card? If you want to treat someone special to a Toby Carvery meal, a Toby Carvery gift card is perfect. You can buy Toby Carvery gift cards online to be delivered via email or SMS. Gift cards can be loaded with up to £100. The recipient can print off their voucher or show their smartphone when they go for a meal at their local Toby Carvery. On the Toby Carvery website there is an online support system, find it here. Toby Carvery is the King of the Great British Roast. If you love your Sunday lunch or a tasty supper any day of the week in fact, our Toby Carvery vouchers will go down a treat. You don't need to empty your pockets to let the whole family enjoy a generous helping of Sunday fare this summer. When Toby serves up a delicious roast every plus popular breakfasts, puddings and more to enjoy — there's always an opportunity to tuck in at Toby Carvery! The Toby Carvery chefs are happy to impart their expert knowledge to aspiring cooks. If you check the Toby Carvery website, there is a section on ‘Quick Tips’ which tells you how to carve meat, prepare perfect pork crackling, achieve a sensational Yorkshire pudding, and plenty more besides. Since we can’t eat out at Toby Carvery every night, this is the next best thing! The Classic Carvery menu gives you a choice of pork, beef, turkey or honey-glazed gammon, accompanied by freshly cooked vegetables and a huge Yorkshire pudding. You can enjoy just one type of meat, or sample a bit of all four. Bring along the Toby Carvery offers from vouchercloud, and you can polish off the whole plate for a budget price.